On this day the 16th Ohio started at 7:00 am and marched 15 miles further north to Carrion Crow bayou enduring a cold, heavy rain most of the day. Research is not currently able to identify a more precise location of the route or camp but the approximate positions, shown, should be very close. Carencro (historically French: St.-Pierre) is a small city in Lafayette Parish, Louisiana. It is a suburb of the nearby city of Lafayette. Its name comes from the Cajun French word for buzzard: the spot was one where large flocks of buzzards roosted in the bald cypress trees. The name means 'carrion crow'. 1863 military map showing the approximate route of the 16th Ohio on its march from near Vermilionville (modern day Lafayette) to Carrion Crow bayou on October 23, 1863. 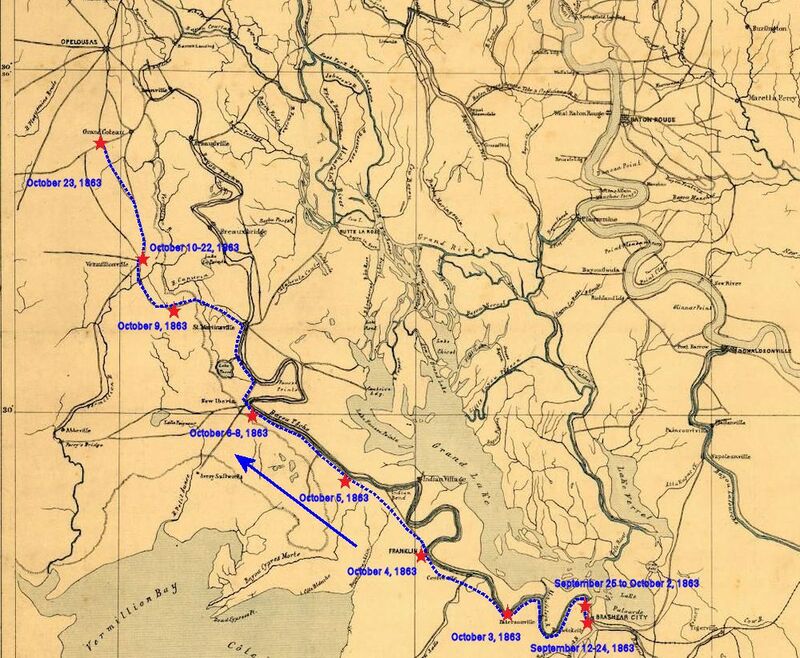 Modern day map showing the approximate route of the 16th Ohio on its march from near Vermilionville (modern day Lafayette) to Carrion Crow bayou on October 23, 1863. Blue pin - Approximate location of the 16th Ohio, northwest of Franklin, Louisiana, October 5, 1863. Lavender pin - Approximate location of the 16th Ohio, southeast of New Iberia, Louisiana, October 6-8, 1863. Aqua pin - Approximate location of the 16th Ohio, October 9, 1863. 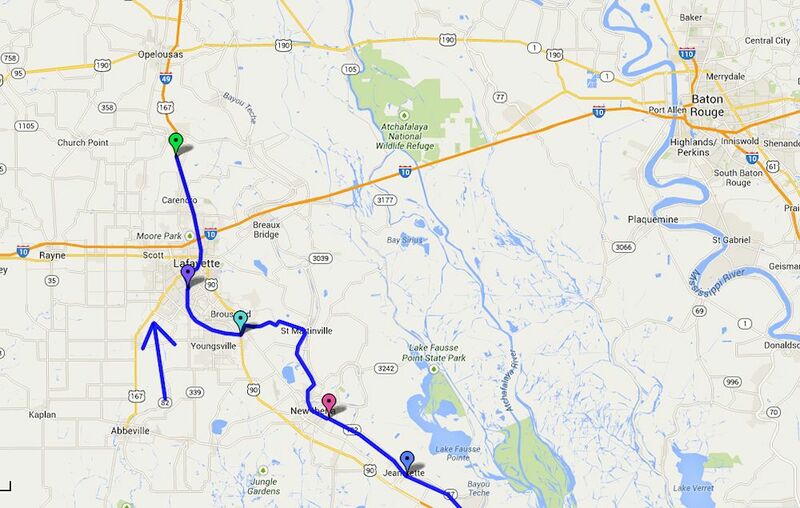 Purple pin -Approximate location of the campsite of the 16th Ohio on the Vermilion Bayou (or River) near Vermilionville, Louisiana, from October 10 to 23, 1863. Green pin - Approximate location of the 16th Ohio at or near Carrion Crow Bayou, October 23, 1863. It is hoped additional research will provide a more precise location of the troops camp in this area.